Today, the Arab and Gulf region accounts for more than 500 million daily internet users, more than half of whom use smartphones for web surfing and to access information on-the-go. With this steady rise in smartphone adoption, there are many takers for original smartphone apps featuring Arabic content. At Outsource2india, we have considerable experience in developing native, multilingual, Arabic apps for iOS, Android, and Windows which target the Middle East and North African Arabic speakers. At O2I, we believe that making a great Arabic app does not only require stellar code development and beautiful aesthetics, but an in-depth understanding of the language and regional culture. We have worked with many companies in the UAE, and developed government-licensed apps based out of Saudi Arabia, UAE, Qatar, etc. We have vast expertise in developing different kinds of app for diverse business uses. Share your app development idea with us; and we will develop a bilingual or multilingual app in a language of your choice. We are proud to have created the only Government approved Charity app in the UAE. The app is bilingual in nature, has a seamless UX, and allows users to make donations online and check the latest projects in a highly-secure environment. The app was functional both offline and online, and is well-received by the UAE Government and the customers. We created a highly functional app which is a word-to-word translation for a UAE-based technology company's website. It features a common admin panel for both the website and the mobile app and integrates easy online payments along with a secure backend. The app was developed for the iPhone, and the client was extremely satisfied with the end result. Why Outsource Arabic Application Development to O2I? At Outsource2india, our mobile app development expertise covers the whole gamut of enterprise, entertainment, gaming, and servicing industry. We develop high-quality iOS, Android, and Windows apps, and our Arabic app development proficiency ensures significant ROI for our clients. Be it hybrid apps or native apps, we can develop it all, as per your requirements, and within tight schedules. 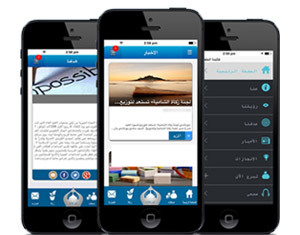 Contact us for high-quality Arabic app development services.